Exercise Boosts the Immune Response: Should You Exercise When You Are Sick? Cover Your Mouth When Sneezing! 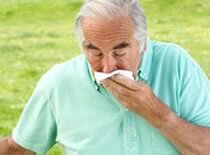 The cold and flu season seems to no longer be a season but a constant sharing of germs and sneezes in many of the corporate offices I visit. Aside from sleep and fluids some people swear that exercising helps keep them from getting many of these office bugs. According to a recent press release from the American College of Sports Medicine, sometimes it’s better to rest when you are sick versus exercise. However, exercise does help boost your body’s immune response. So how do you know when to work out and when to stay in bed? ACSM Fellow David C. Nieman, Dr.P.H., says that moderate exercise (30 minutes a day, on most, if not all, days of the week) actually lowers the risk for respiratory infections. Prolonged, intense exercise, on the other hand, can weaken the immune system and allow viruses to gain a foothold and spread. Read more from the press releases including Dr. Nieman’s 4 Tips on when to exercise and when to rest here. And for a more detailed Fact Sheet on the relationship between safe exercise and illnesses download the ACSM fact sheet: “Exercise and the Common Cold,” This fact sheet was written by Dr. Nieman.